… journeys, travel, London, England, Denmark, The Netherlands? 1. Snobs by Julian Fellowes. Fellowes is best known as the creator and writer of Downton Abbey but he is also an accomplished novelist. Snobs was his first novel. Set in London and rural England, it tells the story of beautiful Edith Lavery who marries, but not for love, a wealthy English aristocrat. If you like Downton Abbey, you’ll enjoy this. 2. Letters from London by Julian Barnes. Barnes was the London Correspondent to the New Yorker for four years from 1990 to 1994. This book is a collection of his published essays from that period. For instance, in an essay called “Froggy, froggy, froggy” he describes the opening of the Channel Tunnel in 1994, which forever linked “old enemies” Britain and France (unfortunately we won’t have time to ride the Channel Tunnel on this trip). My favourite essay is the cautionary tale of the fall of Lloyds of London. A wonderful book. 3. The Stages: A Novel by Thom Satterlee. I mentioned this book in a previous post. It tells the story of Daniel Peters, a man with Asperger’s who lives in Copenhagen and works as a translator at the Kierkegaard Research Center. The novel starts with the murder of his boss and former girlfriend and the theft of a newly discovered Kierkegaard manuscript. Daniel is suspected and joints the hunt for the real murderer, although his Asperger’s makes it difficult for him to interpret the behaviour of others and to deal with the twists and turns of the murder mystery. The book paints a loving picture of Copenhagen and the Danish people, as well as a realistic portrait of living a life with Asperger’s. 4. The Hobbit or There and Back Again by Oxford Professor, J.R.R. Tolkien. The quintessential travel story. A life changing journey. Oliver and I have been reading The Hobbit and we recently watched the first instalment of the three-part movie. We don’t expect our journey to be as eventful as Bilbo’s, although Oliver is willing to give Midsummer Night’s Dream a whirl at Shakespeare’s Globe Theatre London if he is likely to see elves and dwarves! 5. 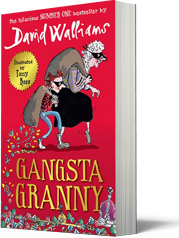 Gangsta Granny by David Walliams. You might know Walliams as one half of the Little Britain team. This book is set in London. It tells the story of Ben who is sent to stay at his Granny’s house. He thinks she is really boring until he finds out that she used to be an international jewel thief and all her life she has plotted to steal the Crown Jewels from the Tower of London. Now that Ben is staying, she has the help she needs to do it. Oliver loved this book; it’s the reason we are visiting the Tower of London during our visit. Do you have some favourite books about journeys and travel? Or favourite books set in or about any of the places we will visit? This entry was posted in Before our trip, In Copenhagen, In London on May 27, 2013 by Amanda Barnier.